This week on Kotaku Splitscreen, we raided some tombs. Jason’s on vacation, so I was joined in his stead by my colleague Maddy Myers to talk about the PlayStation Classic, Nintendo’s new Switch Online service, the exciting Destiny 2 raid, and new safety concerns among professional streamers. 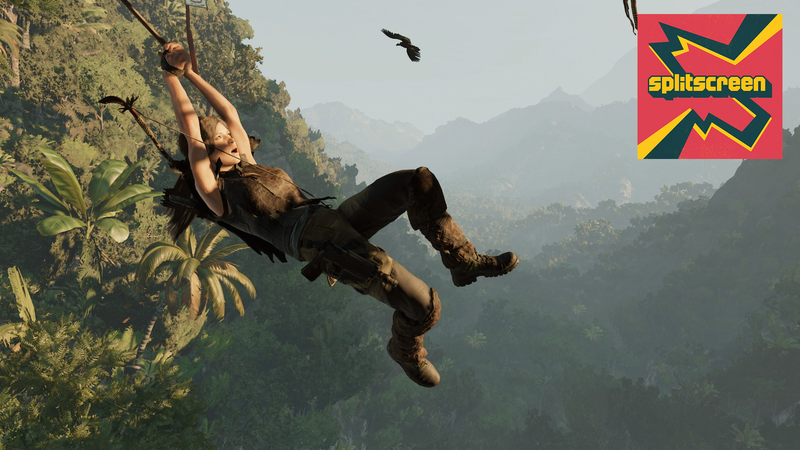 Then Stephen Totilo came on to talk with us about Shadow of the Tomb Raider, which he reviewed and I’ve played a bit of. We closed out with some talk of Assassin’s Creed Origins, a couple off-topic recommendations, and as always, a music pick of the week. Here’s a lightly edited transcript from part of our chat, when we discussed our concerns about how little buzz Shadow of the Tomb Raider has generated, and theorize as to why that might be. Stephen Totilo: I have this whole anxiety about this game that I shouldn’t have. But I can’t help it, and I’ll just acknowledge it. The game is gorgeous, right. It’s one of the best-looking games I’ve ever seen. Would you agree, Kirk? One of the best-looking games you’ve ever seen? Maddy Myers: [laughing] Immediate disagreement. Kirk hates how it looks. Kirk: Well, superlatives are dicy! Stephen: It’s an amazing... come on. How many other games have done trees with that many leaves, Kirk! Come on. I don’t know what games Kirk is playing. Kirk: [laughing] It’s a very expensive- and lovely-looking game. Stephen: It’s a very expensive-looking game. It seems very expensive in the amount of world they’ve made, credit to them that you can switch a lot of the dialogue from English to whatever the native language would be of the people you’re speaking to, which is in some cases Spanish and in some cases Yucatec Mayan. Yes, it’s Mayan stuff, even though it’s in Peru, which the game makes a point of talking about, why that is, and it sort of explains why this stuff is so hidden, because people wouldn’t think to look for Mayan civilizations in Peru. So you can tell it’s a very expensive game, and I don’t feel like the game is going to do that well. I don’t sense a lot of buzz for it. I check out the game’s subreddit, you know, we like to cover games after they come out. I’m trying to get a sense of the vibrancy of the community. And sometimes, games do super well and yet they don’t have a very exciting post-release life span. Far Cry 5, for example, supposedly the top-selling game of this year, according to the NPD group, which tracks sales in America. And yet I don’t feel like its post-release life has been all that interesting. And that could be the case for what’s going on with Tomb Raider, but I really feel like it’s the case that there’s not a lot of buzz for this game. And I’m like, man, I really want people to still make games like this. I really want them to still make games where A), it’s a lengthy single-player game. That’s the kind of game I like. I like to explore environments, you know, Metroid-style, do some backtracking, which you do do in these newer Tomb Raiders. And I really appreciate the extra mile they went with the language stuff and some of the other bits of attention to detail. And so I can’t help but think, I play a game to enjoy it, and yes also to cover it for the readers, but I can’t help but find myself invested in some weird way in its success. I really hope this is not a boondoggle, because I want more games like this to exist. And it’s weird to feel so much sympathy for, like, it’s a triple-A game, they’re gonna be fine. Square Enix is gonna make a lot of Kingdom Hearts money, and they can afford to spread that around to the next Tomb Raider. But you know, I see these super expensive games, and I sometimes wonder if the price tags on them will ever give sticker shock, or buyer’s remorse, or whatever the right expression would be after the fact, and these big companies decide, oh, crap, we can’t do another one of these! Look how that one just did! Stephen: The anxiety, or just the sense that it’s not having an exciting post-release life? Kirk: Well, I share how I like these kinds of games, too. I want to play more games like this. Games that smartly mix puzzles and stealth sections... especially, I’ve been struck by how puzzley this game is. It’s almost a puzzle game [first and foremost]. There’s more puzzles than action sequences so far, which is really cool. I think in this case, specifically though, Spider-Man just killed it. And I think that really is what’s happened, in terms of who’s talking about it when. I remember this kind of happening to Rise of the Tomb Raider too, for different reasons. It [launched as] an Xbox One exclusive, so there was this kind of weird thing where no one could play it. But there would be these vocal readers, and they’d be in our comments, you know, [Rise] wasn’t on the Xbox One bests list, our list of the best Xbox games. And there were people saying, “Why isn’t this on [the] list?” It wasn’t on our Games of the Year list. “Why isn’t Rise of the Tomb Raider there? It was really good!” And I think that over time, it came out on more systems, and more people came to appreciate, oh yeah, that was a really good game. Maddy: Hmm, Lara Croft is basically a superhero at this point. Stephen: Which, credit to them for hitting those notes, right? That’s unusual. Kirk: Right, and I’m not saying that’s a bad thing. It’s just that in contrast to Spider-Man, which is this wonderful, really humanistic look at being a hero and trying to be a better person, with these fabulous characters who support one another... the vibe is so different. And when you look at what people kinda want right now, not just from video games, but in general, it just seems like Spider-Man has totally dominated the [video game] conversation. And that’s despite the fact that to Tomb Raider’s credit, it is the Uncharted game you can play on something other than a PS4. And you need a PS4 to play Spider-Man. That’s always kind of been an appeal of Tomb Raider, I just don’t know that at this exact moment in time, that it’s enough to get people talking about it. For much more, listen to the entire episode. As always, you can subscribe to us on Apple Podcasts and Google Play to get every episode as it happens. Stay tuned to our feed this week for a special wild-west bonus that’ll drop tomorrow. Leave us a review if you like what you hear, and reach us at splitscreen@kotaku.com with any and all questions, requests, and suggestions.